How Do I file a NOTAM to the FAA for my drone flight? Blog How do I file a NOTAM before flying my drone for business? How do I file a NOTAM before flying my drone for business? 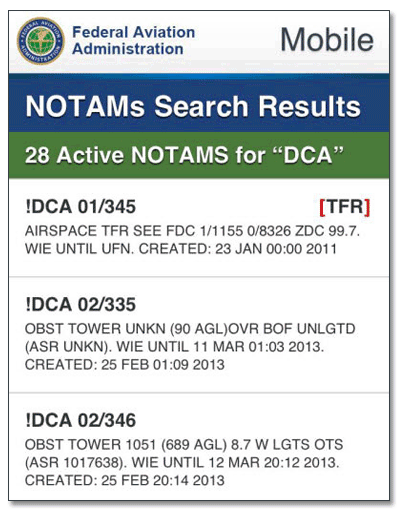 The acronym “NOTAM” stands for “Notice to Airmen” and are informational advisories. NOTAMs are not laws. They are filed with the Federal Aviation Administration (FAA) to give pilots and remote pilot operators notice of any potential hazards that could affect the safety of their flight.Drone NOTAMs (DROTAMs) can be seen on skyvector.com and other apps and platforms. Lockheed Martin is in charge of the back-end of the FAA’s NOTAM System. Lockheed Martin has added Unmanned Aerial Systems (UAS or drones) flight areas, in addition to manned flights, to this alerting service as well. Do you need to speak to a drone attorney about your drone operation? Click here. Do you need sUAS specific drone contracts for your customer drone contract form, flight crew independent contractor agreement form, Part 107 operations manuals, notice of UAV Operations or other drone documents and forms? The NOTAM system for drones was called the DROTAM system on now is simply filing a sUAS NOTAM, also available through the Flight Service website and register for a free account. You must create an account to use this service. 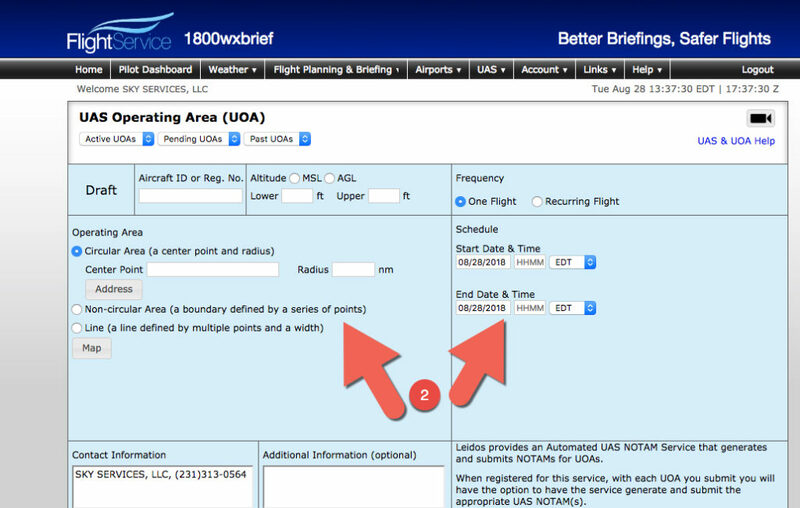 Once logged in, choose “planning” under the UAS option. Your will arrive at this screen where you can define your flight operation and location. See video below for instructions on how to fill out the form. Now, follow the instructions in this video. 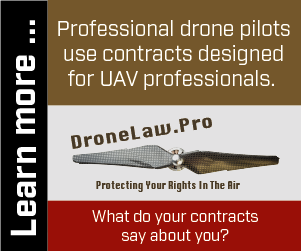 Do You Need Drone Contract Forms? The Drone Documents You Need to Succeed. Your FAA Section 333 Exemption “conditions and limitations” requires you to do any number of things to fly your drone legally. One item is to conduct all drone flight operations under a COA (Certificate of Waiver or Authorization) which will then require you to file a NOTAM (Notice to Airman) no earlier than 24 hours, and not more than 48 Hours, before each flight operation. D. Notice to Airmen (NOTAM). (3) Time and nature of the activity. (4) Number of UAS flying in the operating area. Because the FAA defines a sUAS (drone) as an “aircraft,” sUAS operations (including those involving Model Aircraft) must be conducted in accordance with the airspace restrictions, including special flight rules and in Notices to Airmen (NOTAM) that define Temporary Flight Restrictions (TFR). How do I file a NOTAM with the FAA? ENRICO: Welcome to DroneLaw.Pro. Today, we are here with Rob Dreer and Rob is a paralegal/SUAS paralegal for Traverse Legal and DroneLaw.pro. He is also a flight instructor over at Northwestern Michigan College, which has a SUAS program and he teaches a variety of SUAS classes over there. Welcome to the show, Rob. ENRICO: So Rob, we have a lot of clients who are or have either obtained their Section 333 Exemption or are in the process of getting their Section 333 Exemptions and one of the things we like to do is to help educate them concerning how to fly within the Exemption. And I always tell people that their focus will quickly shift from getting the exemption to flying within the thirty-some limitations that will be included in the Exemption. So today I want to talk a little bit about the requirement to file what’s called a Notice to Airman, a NOTAM, within twenty-four to forty-eight hours of your flight before putting a drone into the air. You have to file one of these NOTAMs for each flight for each operation. So Rob, tell us a little bit about what a NOTAM is and why the FAA wants Section 333 commercial drone operators to file one? ROB: So the Notice to Airmen or NOTAM is a tool used by manned aviator so they can be made aware of situations that may affect them in any given airspace that they are flying in. So the way the NOTAMs are designed to work is you call into a flight briefer or you can go onto the automated flight briefer website and you give them certain pieces of information regarding certain blocks of airspace that allows specific hazards or high volume operations and things of that nature like air shows, for instance, you would issue a NOTAM for heavy volume of flight traffic or flight training. There are airport closures and other sorts of situations where you would want to be made aware of the special condition before you fly. ENRICO: So we want to think of the NOTAM as this giant database of information about what is going on in a particular airspace and a particular time. So everyone who is operating or related to airspace is supposed to file information and put information into this database so that airports and air traffic controllers and pilots and drone operators can see what is happening in the airspace. So for instance, TFR would be one of the items that might show up in a NOTAM, correct? ROB: That is correct and that is a really good point, Enrico. Often times there are hazards that pilots need to be made aware of. For instance, we have all these situations out west where the forest fighter aircraft or firefighting aircraft are getting grounded because UAS operators are up trying to see what’s going on. We have a lot of curious hobbyist users out there. So a forest fire is one instance where a TFR would be issued. TFRs can be used as a planning tool for the UAS operators so you can see where you can and cannot fly but they are also a notification tool for the manned aviators so they know what areas to avoid. Of course, we don’t want any collisions so it is important for us to know where we can’t fly. It is important to let other people know where we are so they can avoid our areas as well so we could be joint shared responsible users of the airspace. ENRICO: Drone pilots need to think of the NOTAM as a two-way communication structure. Number 1, they’re going to get information when they think I am going to go put my drone in the air at this location at this time on this date. They are going to be able to get information about hazards or TFRs or restrictions or things that are going on in that air space. They are also putting their information into the system so that everyone else can see what they’re going, correct? ROB: For instance, I recently filed a NOTAM for one of our local areas and one of my fellow flight instructors here at the college, he saw it pop up when he did his preflight checks. He actually emailed me and said, “Hey Rob, is this you?” and I said, “Yes”. In addition to what that says, I will actually be out here and ending a little early and so he knew from contacting me that I would be not be using that airspace the whole time and so here at the college, we are able to foster a very professional working environment between our manned aviators and our unmanned aviators. ENRICO: Let’s talk a little bit about what has to happen in terms of filing the NOTAM and how you go about doing that? Now, the requirements for drone operators is to file a NOTAM in the period of 24 and 48 hours of their flight, correct? ROB: Yeah, that is correct. And so when you do that, you are going to want to take into account that you don’t want to wait until 24 hours prior to your flight because you are cutting it rather close so I would actually go more towards the 48 hours. It makes a lot of sense that we do it that far out and at least 24 hours out because that allows the people who might do pre-flight planning the day prior for say for a morning flight to see that pop up in their system. Often times, when you do a pre-flight check in the morning, you might be a little rushed or a little bit hurried, I know I have had my long cross-country flight because I’ve done in the morning where I am trying to get processed all the information. So the more information you see earlier, the better. Per Federal Aviation Administration (FAA) direction, a NOTAM should be filed for Unmanned Aircraft System (UAS) operations intended for commercial purposes, and for UAS operations that will be within National Airspace System. If your account provides you with the capability to distribute a NOTAM for your UOA, then to have a NOTAM filed for your UAS operation, complete and submit this form with the Submit NOTAM checkbox selected. Note, you may preview the NOTAM prior to submission. This form allows you to define a single UAS operation, or a recurring operation. For a single flight enter the Start Date & Time and End Date & Time during which the UAS will be actively flying. For a recurring operation enter an overall start and end date, the days of the week the UAS will operate within these start and end dates, and the times of flight on these days. You may update this UOA form after submission, and you may cancel it. To access your submitted form, retrieve it from the “Active UOAs” or the “Pending UOAs” dropdown menu. When modifying your submitted form if the form had an associated NOTAM, it will be canceled and a new NOTAM will be issued. When canceling your submitted form, its associated NOTAM will also be canceled. For help in filling out this form, hover or click on the individual input field labels for directions regarding how to properly fill out the fields. ENRICO: I am a drone operator and I’ve got flights planned between Wednesday and Friday of this week. It is a Monday. I can now start filing NOTAMs for my Wednesday flights and on Tuesday, I can start filing NOTAMs for my Thursday’s flights and etc. And I am going to be filing NOTAMS for a particular flight or for a particular operation if I have multiple flights or multiple operations and I am going to be filing multiple NOTAMs. Now there is a little bit of flexibility there in terms of if I am going to be flying downtown area throughout the day with five different flights over a period of four hours, so theoretically, you could put in a NOTAM for all those operations. There is some flexibility within the system and there is some gray area which is out there, but the main point is you want to follow the fundamental rule that if you are going to file a NOTAM the point is to let other people know that your drone is going to be flying in a particular air space. And so you don’t want to get too broad with your NOTAMs because they don’t you saying that your aircraft is going to be flying in an airspace when, in fact, it is not. And so tell us a little bit, Rob, about what it is a drone operator will need to do in order to file a NOTAM. How does that happen? ROB: If you want to go and file a NOTAM, the first thing you are going to have to figure out before you ever make the call is where exactly are you going to fly. You eluded to the fact that you want to find out a general geographic area of where you are going to fly. If we are talking in an area like Traverse City and you have the proper authorization to fly in that area, I wouldn’t recommend issuing a specific NOTAM for each maybe house in each neighborhood that you are going to fly. If you have a base geographic area of perhaps five or eight miles that would make sense to just file one NOTAM and give them the center point of where you are going to be operating and then your entire radius of that area. Aircraft cover a lot of ground really fast so they don’t necessarily need to know each individual location you’re flying. Now if you are talking several areas, say you’re in the Chicagoland area, and you have a couple of flights on the north end of the Metro and then you have a couple of flights on the south end of the Metro. Of course it would make more sense to define areas to the north and the south and what times you are going to be operating in those areas so that your location is more specific and pinpointed. And like you said, you don’t want to say that I am going to flying somewhere in the State of Michigan from the hours of sunrise to sunset because that doesn’t help anybody at all. ENRICO: In the Chicago landing example, you would recommend filing two NOTAMs in that instance for morning flights in the south inference and afternoon flights as a separate NOTAM in the system. Correct? ROB: Yes. And if we have our larger corporate users out there, they may be doing multiple operations at one time, and so may be it makes sense to have both of those active at the same time as well. ENRICO: So how does someone file a NOTAM? How do you do that? ROB: You would go on, once you have the location information, you would go on and you could use the 1-800-WXBRIEF. One eight hundred weather brief or you can go on the online website www.1800wxbrief.com and that will allow you to get into contact with Lockheed Flight Service Briefer. They are the subcontractors who manages our flight service system and when you contact them, you are going to let them know what state that you are going to process your NOTAM for and that allows them to pinpoint specifically who you need to talk to that’s a specialist in your area. 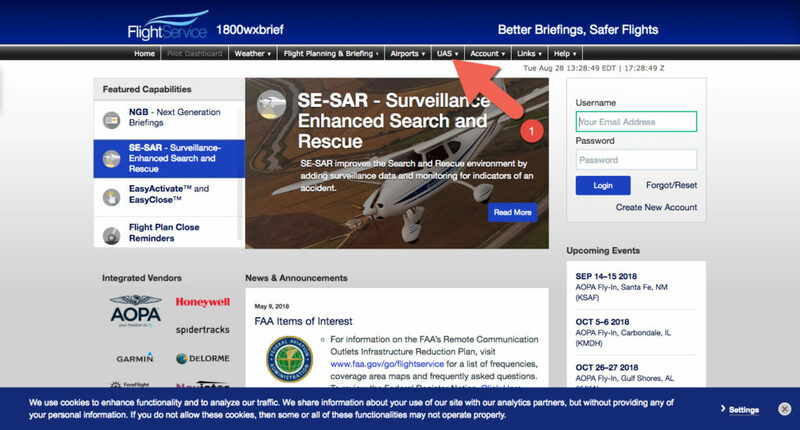 NB: Lockheed is still bringing their 1800wxbrief.com sUAS NOTAM system online. ENRICO: You can either call or you can do it online and, if you call, there is going to be a representative on the other end and ask you a series of questions. If you go online, you’ll fill out some data fields and get the information in the NOTAM that way, correct? ROB: I actually prefer doing it over the telephone because the Flight Service Briefer is there to help you. Here is how to call in your NOTAM; The easiest way to file a NOTAM. When calling Lockheed Martin Flight Services, you can use the following “quick steps” to navigate through the LMFS Call Tree, in place of voice recognition. Press 1 to speak to a Briefer, and enter the two digit postal State Code on your telephone keypad (see table, below). Press 3 to listen to TIBS, enter in the two digit postal State Code on your telephone keypad (see table, below). Press 5 to hear Special Announcements. LROB: Lockheed Martin Flight Services can do a sanity check to make sure your information is correct. So when you call these individuals, they’re going to ask you several pieces of key information and one of those pieces of information is going to be location of where the flight is going to be. Now, they are going to need that location in reference to a navigational aid. A navigational aid can be something like a VOR. It can be a non-directional beacon. So once you have that navigation aid, for instance in our local area, I use Tango-Victor-Charlie (the Traverse City VOR). ENRICO: The VOR for our listeners means what? ROB: Very high frequency omnidirectional range and it is a navigational tool used to travel from point-to-point using radio signals. ENRICO: These navigational aids show up on air and nautical charts. Our 333 clients are going to have to access these air and nautical charts in order to provide a location for the NOTAM and then to identify a radius around that navigational aid. Where can our clients go to find information about navigational aids? ROB: There are several sources where you can get that information. There’s the old antiquated paper chart, for which I do not recommend, but there are several electronic versions that I would recommend. The most premier version that I love to use is ForeFlight. That is F-O-R-E-F-L-I-G-H-T. ForeFlight is an application that is a full service one-stop for all the air nautical data, all the FAA air publications and documentation that you could possibly want. It shows digitized maps that can be zoomed in and scaled differently. You have all the different types of air nautical charts that you can use. It allows measuring. It allows you to see whether or not an airport has an instrument procedure, air traffic control tower, which we know is an important factor in our COA process of where we can and cannot fly. ENRICO: Sure. And so they will go to Foreflight.com, F-O-R-E-F-L-I-G-H-T dot-com, or they will download it on their iPhone or Android operating systems and then they can use that software to identify where they want to fly, locate the nearest navigational aid, be able to tell the representative at Lockheed where they are going to be flying in relation to that aid and then from there, they will provide some other information. Is that correct? ROB: That is correct. And of course there is a free subscription for those of you who want to give it a trial go before you actually buy it and then if its determine that it’s not really in your business model to buy it, there is also free versions of that like SkyVector.com that has a lot of the same information just in a less readily easily usable form. ENRICO: What other kind of information is the FAA looking for on these NOTAMs that people are going to have to be able to provide when they either call or use the online system to identify a flight? ROB: Once you have identified what navigational aid you are going to use, you are going to find a bearing, a direction from that navigational aid and often time those charts have those with a compass dial around it and so you will determine your directions and so forth, say North, and you can say I am on the three-six-zero degree radial, which is a direction according to a compass heading from that navigational aid and then you will give them a distance. So, for instance, if someone out in Traverse City was operating over the Old Mission Peninsula, they could say I was operating on the three-six-zero degree radial north of the Traverse City VOR thirty miles on a three-six-zero degree bearing. You can also provide a lat/long position for your flight, and flight diameter. Here are instructions on how to fill out a NOTAM. ENRICO: Right. And they are going to want your contact information and, for instance, your name and a way to contact you in case there is some conflicting operations in the area so that people can coordinate those things, correct? ROB: Yes they would and so other pieces of information they need in addition to your name and phone number is they’re going to need the radius to find the working area you’re going to be at from that location. They are going to need your maximum altitude, which under the blanket COA is two hundred feet. So you could say surface to two hundred feet EGL would be the format you give them and they’re going to need the time which defines your working area. When are you going to be there? When is that going to be a hazard to other aviation users? ENRICO: Lockheed Martin, they are the subcontractor for the FAA on NOTAMs. It is their job to get the information and run the NOTAM system and they’ve got this great operation called Flight Service, which they’re there to help you. They are there to take your information and guide you through the process. Our recommendation is as you start to work through the administrative portion of being a drone operator and running a drone service, is to start to get a feel for the NOTAM system. Go ahead and you can file a NOTAM if you are a recreational user as well, can’t you? ROB: Yes you can. As a matter of fact, a NOTAM can be used any time that you know that there may be hazards or a special situation that would cause interference with other airspace users. Model rocketry clubs, they could file NOTAMs for the operations they do. So if you were out practicing, for instance, getting ready in advanced of your 333 and acting as a hobbyist just practicing flying you could actually practice your work flows and develop those work flows for gaining a NOTAM by, for instance, going out and just filing a NOTAM for a flight for just an hour so you’re not taking up a lot of airspace but your also letting people know where you are flying and you are getting used to how the NOTAM system works and it will make you a much more efficient UAS operator in the long run by starting issuing these NOTAMs now. ENRICO: Commercial operators may need to file a NOTAMs 24 to 48 hours in that range, depending on what their Section 333 requires, and whether they are flying outside the blanket COA. Recreational drone operators do not, but you still can and should because once you get your Section 333 exemption, you are going to want to get at it and start charging customers and running drone flight operations and you are going to need to understand how to file a NOTAM. How that NOTAM system works. Rob, great having you on the show today. Thanks so much for all your valuable insights and we will see you next time on DroneLaw.pro.